Connecticut Tax Free Week 2019 starts August18th. Connecticut Department of Revenue Services finalize Full CT Sales Tax Holiday 2019 Details PDF: CT Tax Free Week Source. The state of Connecticut is offering a tax free week during August 2019. It applies mainly to clothing and shoes and is intended to coincide with parents’ seasonal back-to-school shopping needs. Sunday August 18 through Saturday, August 24. 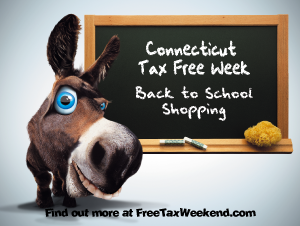 Note: Connecticut’s 2019 tax free shopping dates have not been released yet. However, based on last year’s dates (shown below), it is likely that Connecticut’s tax free holiday will occur in August 2019. This page will be updated once those dates are officially confirmed on Connecticut’s web site. Tax Free Week in Connecticut 2019 Connecticut Department of Revenue Services available here.